With inspiration drawn from travels across the country, Tehueti takes pride in creating everything handmade and plush. Their artisanal tableware and luxurious linen is a also a sweet reminder of why our mums love hoarding so much. The brand believes in one’s home being one’s sanctuary; a restorative place where one can kick back with a bag of chips (or whatever else qualifies as your comfort food). 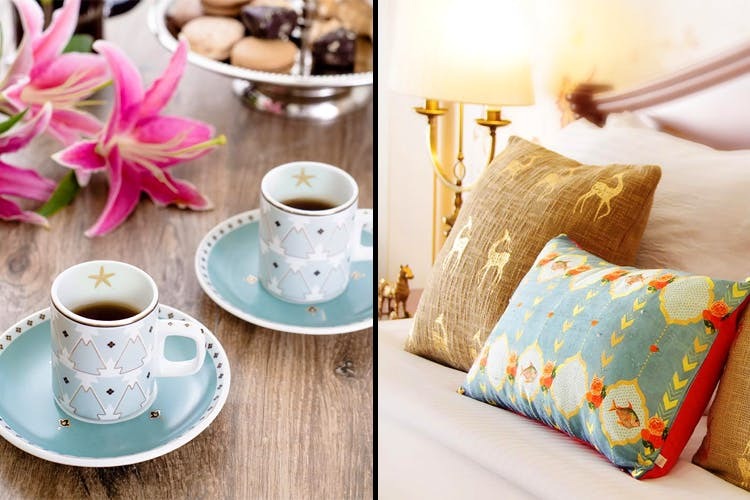 With influences spreading across Jaipur’s many jharokhas and the Hawa Mahal’s architecture to the fascinating world of gazelles far, far away, they have managed to craft three different collections that have a soul and character of their own. These espresso cup and saucer in subtle azure hues are a throwback to a Greece holiday we never had. Tapas-quarter plates to coffee mugs with hand-drawn motifs evoke a feeling of calm that brands doing outrageously funky stuff can never rival. How beautiful are these cushion covers in the finest cotton? So, if you’re one for subdued, subtle pastels and decor that blends in, instead of stick out, Tehueti needs to be on your radar. The folks behind the brand also claim that they use natural materials in the crafting process, making us a little partial towards them. We have to agree that Tehueti might not sit right in our rented apartment but it makes for great grown-up gifts (INR 3k for tea/coffee time cutlery isn’t exactly a budget buy). Just look yourself in this mirror and say that you don’t want these additions to your forever home. We dare you.